Once again the Edmonton Oilers will be selecting first overall in this years draft. It will only be the second time in NHL history that a team has selected first in three consecutive years, Oilers and the defunct Quebec Nordiques. The Oilers will be the first team since the introduction of the lottery; while the Oilers have been unlucky these past years with the injury bug, they have certainly been lucky with the lottery ball. Unlike the previous two drafts, this years draft truly has an undisputed no.1 ranked player. There continues to be some debate on whether Taylor Hall and Ryan Nugent-Hopkins was the best player in their class, there will be no argument when it comes to Nail Yakupov at this years draft. How good is Nail Yakupov, well can you say Pavel Bure! That's right, he could end up being the next "Russian Rocket." In 65 games this year he has put up 101 points in the OHL. He has lighting speed and a goal scorer instinct that will be prominent in the NHL. The only concern with Nail is his size, at 5'11 he won't be bulldozing over players but 190 pounds he won't be pushed around either. The question many Oiler fans is where does Yakupov fit into our line-up? With Jordan Eberle and recently signed Ales Hemsky, there is no room for Nail in the top six forwards. Fans and hockey media are suggesting the Oilers may very well trade their first overall pick to acquire a much needed defenseman; even Steve Tambellini commented that with winning the lottery, more options have presented itself this summer. Having the first overall pick does present the Oilers a number of options, but the best course of action is to keep the pick and draft Nail. Oilers need to continue the rebuild without pressing the fast forward button. Next year the team will be more experienced and with a little luck, the team will not be injury riddled. 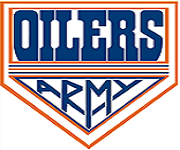 A more experienced healthier Oilers will contend for the playoffs next year regardless of what changes we make. With the addition of Yakupov, the Oilers should be a handful at even strength and the powerplay as well. Hopefully the Oilers are able to sign soon to be UFA Justin Shultz. With these two young additions to the team, the future will be set and we will be contending for the Cup sooner than you think. All we need is a little patience, if we rush the rebuild we'll find ourselves back to square one... ie. Islanders. Those stats you posted are actually for last year, this year he had 69 points in 42 games.